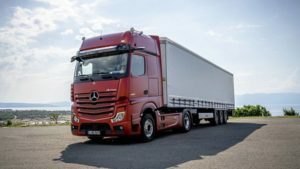 Mercedes-Benz Trucks has revealed a new flagship Actros tractor unit, which features a host of advanced driver assistance and safety features, ahead of the IAA Commerical Vehicle Show in Hannover, Germany. Billed as the brand’s most connected truck ever, the Actros will feature a new Multimedia Cockpit, which connects the driver with digital services and assistance systems, and which features the capability to be further integrated with vehicle-to-vehicle and vehicle-to-hub communications. The system will allow fleet managers to monitor the Actros in real time without delay, and drivers to base digitally. It will also come with several innovative new safety features including Active Drive Assist, which allows the driver to operate the truck semi-autonomously. In addition, the truck’s external mirrors will be superseded by optional rear-view cameras, called “MirrorCam”.